If you are visiting the southern coast of Oregon, a trip to the scenic and wild Chetco River is a must. Fall in love with the Chetco's clear water, beautiful canyons, and mountainous terrain. Located within the Rogue River-Siskiyou National Forest, this 55-mile stream is divided into three segments, the wild, scenic, and recreational, and packs in plenty of fun. Filled with numerous falls and rapids, the Chetco is known for its kayaking, rafting, and of course, salmon and steelhead fishing. Expect to find unparalleled forest views bordering the rugged waters and rock formations. Kayakers will be impressed with Magic Canyon, where emerald green pools and fresh springs meet. There is an access point to the Chetco River at the Port of Brookings Harbor, just minutes from Beachfront Inn. Where can I go fishing on the Chetco River? 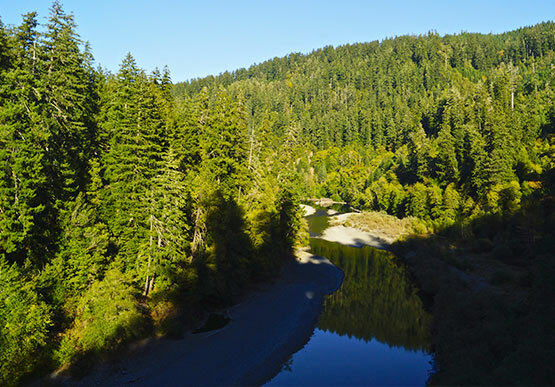 The Chetco River on Oregon’s rugged Southern Coast offers some of the best fishing opportunities in the US. Begin a fishing expedition right from the Port of Brookings Harbor, located right near Beachfront Inn. Catch chinook and salmon in the fall and steelhead in the winter and enjoy the scenic adventures on the Chetco. Where can I go kayaking on the Chetco River? With easy access to the Chetco River right from Brookings Harbor, get comfortable in the calm waters in your kayak before paddling up the Chetco River. Known for more challenging rapids (Class III and IV), you can embark on a kayaking trip from outposts like Northwest Rafting Co that offer journeys for every level. Make sure you paddle up a few miles to experience the wonders of Magic Canyon where emerald green pools and fresh springs surround the canyons.